Before I went in to the tastings this week I was a bit…not nervous, that’s the wrong word…apprehensive. A couple of trusted and respected wine-o’s from the blogosphere had reservations about doing an Amarone week. Their view was that Amarone is amazing if you pay up and get one of the better ones. The “value” end of the spectrum tended to prove a bit disappointing. I was co-op’ed up for the weekend, and the warning was loud and clear! 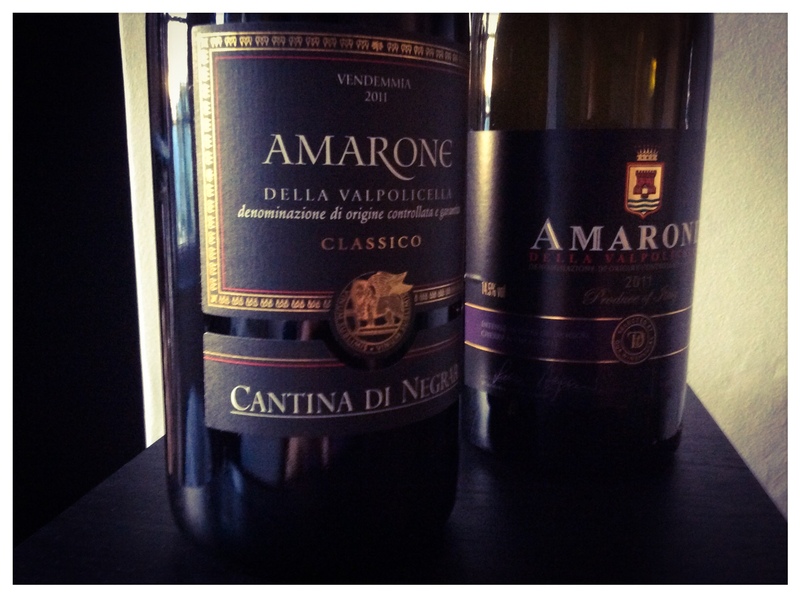 I tried the Amarone from Sainsbury’s ever reliable Taste The Difference range, and the Cantina Negrar from Waitrose. Although both seen as entry level Amarones, you’re still struggling for much change from £20, which is more than the average Joe is looking to spend on their everyday drinking wines. So they must have a bit of game about them, right? The TTD was first up. Looking at it, it was not as dark as I’d expect from an Amarone, on the smell the fruits were still relatively fresh, and on the taste the 14.5% alcohol was…let’s just say present. It all pointed to the less time for the grapes drying out on the racks, and maybe a bit less time in barrels. But look, it’s not aiming to be THAT wine. It’s aiming to be exactly what it is; a good, honest, entry level Amarone. Coffee and wonderful cherry flavours, lots of ripe settled tannins, and a lovely peppery after taste. Add in the £16.50 price tag and you’ve got to give it at least a good 13/20. The Cantina Negrar was next up. A good shade or two darker on the look, and the smells and tastes were much more imposing. Tobacco, coffee, liquorice, damsun, fig, and that ever present dark cherry. I loved the smell! On the taste, again the alcohol wasn’t quite balanced, and the finish was a bit on the short side, but that’s nit-picking. £18.99 for this one, ticked all the boxes of a very decent Amarone. 14/20. 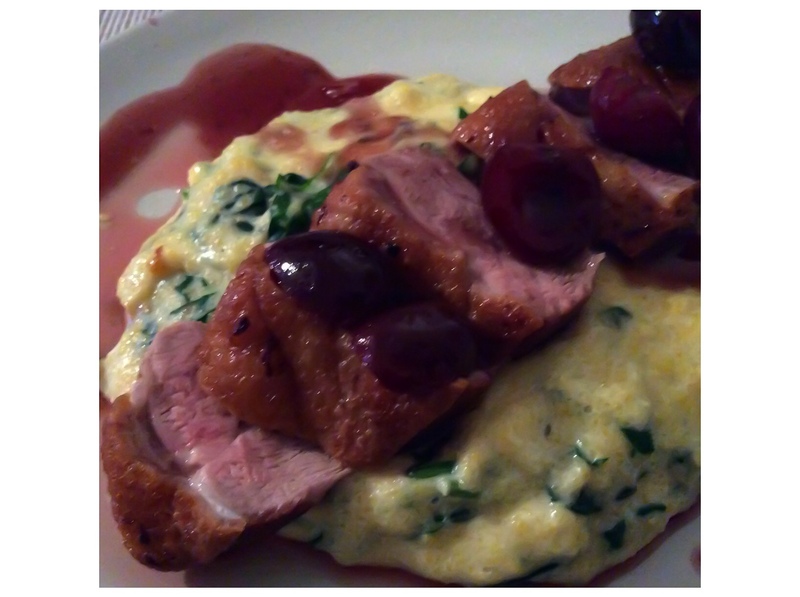 The food pairing of duck and spinach polenta was amazing. I was nervous as I had a foody mate and his wife coming over, but my solution (genius in my view) was to get him to help me cook it! The pairing was perfect, and I am now a polenta convert. A final salute then to Amarone week! NWTW #52 – What to eat with Amarone? Own and private label wines CAN be good quality and good value especially on promotion. Absolutely, and generally representative of the individual wine for newbies to have a try for not too much! I had a brilliant encounter with a Masi wine… I hope it is this good throughout the year! ← #MWWC14 – We’ve all got our traditions!